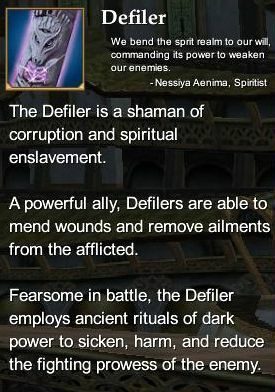 From the Everquest 2 manual: Those who crave power through the corruption and enslavement of the spirit world will find the Defiler class to be an ideal profession. The Defiler best serves as a first line of defense for the party, being able to heal wounds and remove ailments that afflict allies. The Defiler is also able to augment his allies? attributes or enhance their abilities in combat. In addition, the Defiler can weaken and harm enemies with magical attacks. Defiler Epic Weapon Timeline (80) - Rise of Kunark Defiler Epic Weapon. This page last modified 2011-08-25 22:53:51.